I had a pleasant trip recently on a wonderful train that runs from Przemsyl Glowny to Poznan Glowny. My own journey took me only from Przeworsk to Lodz Kaliska, running through Krakow Glowny, Kozlow, Deba Opoczynska, Tomaszow Mazowiecki, and reaching Lodz Kaliska without the usual stop at Lodz Widzew. As I checked out Google Maps to trace my journey through the complex junctions at Koluszki and the freight relieving line at Lodz Olechow I noticed a plane heading for Lodz and a silver blur moving in the same direction, but slightly to the north. Stealth bomber? UFO? I have no idea. As for my train the TLK 37104, that sadly is being abolished in Andrzej Massel’s timetable ‘reform’ being introduced from 1 March. In Europe, level crossing accidents account for only 2% of road deaths, but the 600 people killed each year at level crossings account for a third of all rail fatalities. Almost all accidents at level crossings are due to road users failing to observe mandatory stop lights, signals and basic traffic safety rules. Most accidents involve regulars, those living near and/or making regular use of a level-crossing, as familiarity makes people less careful. In 2009, the European Commission launched the European Level Crossing Awareness Campaign to promote safe behaviour at level crossings. In 2010, as part of campaign, the International Level Crossing Awareness Day was held on 22 June 2010. The Commission also made video material available which could be modified in each country for the national audience. The Latvians went their own way and made a whole series of commercials to encourage safe behaviour on railways. The videos, in a style which is part Trumpton, part Magic Roundabout and part Thomas the Tank Engine would seem to be targeted at a younger audience. Though young children do not drive cars the Estonians clearly intend their railways to be around for a long time to come and are taking a long-term approach to safe practice. As St. Francis Xavier once said, Give me the child until he is seven and I’ll give you the man. The Polish campaign video pulls no punches. 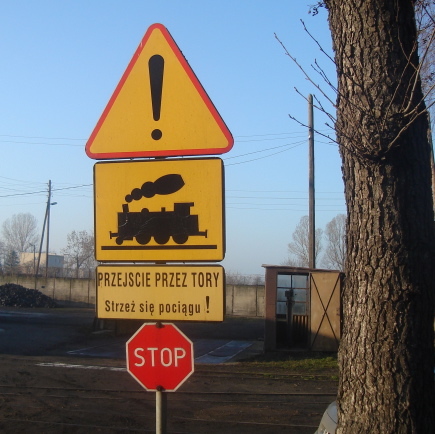 Poland has 200 level crossing accidents each year causing 50 fatalities each year and is in third place in Europe after the Germans (2nd place with 66 fatalities) and Hungarians (1st place with 71 fatalities). Post Fedecrail conference add-on tour. The route of the post Fedecrail Conference add-on tour. 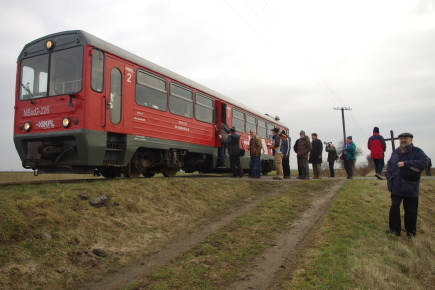 Our friends in the British-Polish Railway and Industrial Heritage Partnership have put together a study tour for members of Fedecrail, the body that represents the interests of Museum and Tourist railways at a European level. The tour will take place from 13 to 18 April. There are three places left over for BTWT readers who would like to join the trip. Railway and industrial heritage locations to be visited include: the Krolowa Luiza coalmine in Zabrze, the Bytom Section of the Upper Silesian narrow gauge railway, the PSMK roundhouse and rolling stock collection at Skierniewice, the Rogow narrow gauge railway and rolling stock collection, Lodz-Lutomersk inter-urban tramway, the Kalisz narrow gauge railway and the Poznan-Wolsztyn steam service. Overnight accommodation has been arranged in 3 star hotels in Wroclaw, Warsaw, Lodz and Poznan. The cost of the 4 full day package is 3,300 PLN. For those who are already familiar with the Poznan – Wolsztyn steam service it is possible to finish the tour a day earlier. The cost of 4 full day package is 3050 PLN. Because the tour takes place immediately after the Fedecrail AGM and Conference in Dresden, the tour starts at Dresden. For those who do not want to start the tour at Dresden, but wish to make their own way to Wroclaw Station for Wednesday evening, their will be a small rebate. EU project notice Karczmiska Station. Photo L Grabczak, Radio Lublin. There seems something distinctly odd about the way that Polish heritage and tourist lines use EU funds. Only a handful of lines have actually benefited from EU funding, but those that have seem wary of spending much money on the basic ‘train set’. Rolling stock continues to be left out in the open and subject to the depredation of vandals and the Polish weather. Infrastructure and rolling stock gets hardly a mention. Track receives the absolute minimum attention. Unique steam locomotives are left to decay as ‘technical monuments’. Meanwhile precious EU funding is focussed elsewhere. Station buildings are restored, or built from scratch, and paved platforms are built where there was once only a few kerb stones and a bank of ballast. Since it is unlikely that all local authority owners suffer from the same tunnel vision, could it be that this obsession with buildings is the result of implementing EU project guidelines set by the Ministry of Regional Development? The Naleczow Railway is the beneficent of a 3.999 million zloty EU-assisted project. 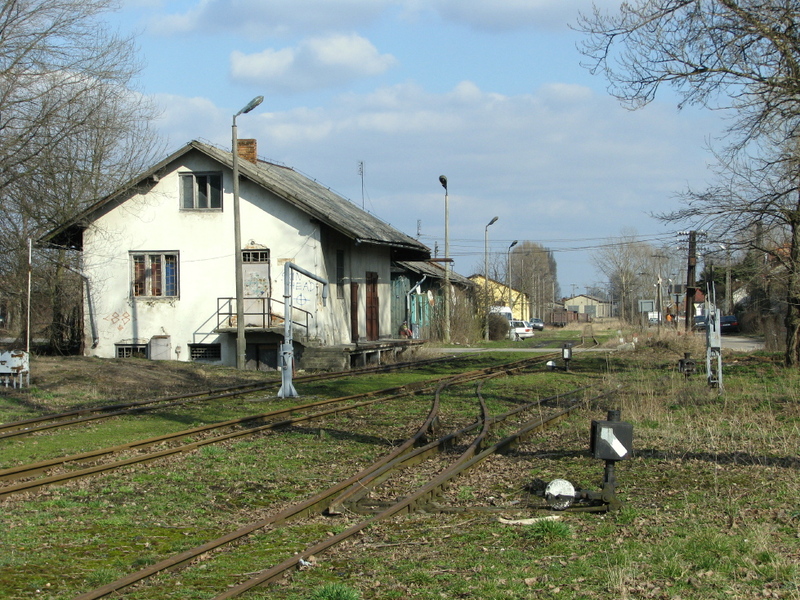 The station buildings at Karczmiska have been immaculately restored, yet the track, rolling and depot buildings continue to present a sorry sight. The railway has not been operational since SKPL ceased operating the line at the end of 2008. 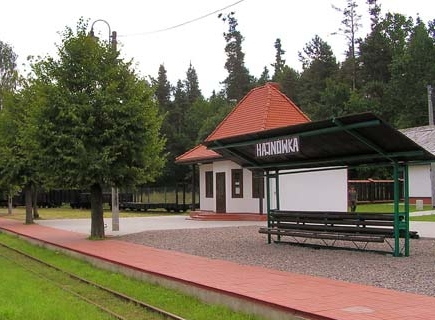 The Bialowieza Forest Railway has built a new station, platform and prestigious office facilities at Hajnowka. 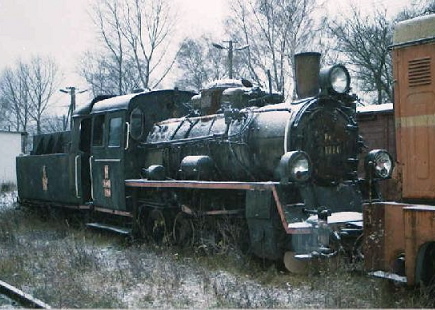 Yet one historic HF ‘Feldbahn’ locomotive languishes in the open, while its sister, which is in near working order, rests in its shed unused for want of a boiler inspection. Visualisation © Ingeno Consult BPK Sp. z o.o. A 47 million PLN (£10 million) EU-assisted project for the Gryfice narrow gauge railway envisages two brand new station buildings, platform awnings, paved platforms, ‘retro’ lamps, art galleries, museums, a library, cafés, cycle hire and bed and breakfast facilities. Yet the railway passes through some of Poland’s most developed seaside tourist infrastructure. Does Rewal Council need to finance all these facilities itself? Are they all necessary? Only 8 km of track of the line’s 40 plus km will receive attention as a result of the program and the railway’s solitary Px48 – borrowed from the Railway Museum in Warsaw – will not be augmented by any additional steam engine. Industrial sidings in Kalisz. Map by Google Maps. Kalisz boasted two major industrial sidings. The first, to the north of the Lodz – Ostrow Wielkopolski main line once served a brickworks and the aeronautical factory now owned by Pratt and Whitney. This is now disused with the connection to the main line taken out. (It is worth noting that private sidings and industrial railways in Poland attract local taxes while private roads do not.) The other siding – to the East of the main line – is operational and serves Kalisz power station and district heating plant. From today, SKPL has taken over responsibility for the operation of the power station siding. At 01:00 hrs. this morning a CTL coal train arrived at the interchange siding. Within an hour 8 coal trucks had been shunted to the power station unloading point, By 02:20 the interchange siding had been cleared and the CTL loco released to continue its journey to Ostrow Wielkopolski. This development is another step on the gradual transformation of SKPL from enthusiast-based heritage line operator to ‘short-line’ operator on the north American model. On 7 February 2011, the Smigiel Railway has ran its first special train since responsibility for the line reverted back to Smigiel Town Council. The train was run under the auspices of the Wolsztyn Experience and was the first service to operate since the withdrawal of SKPL from its role of operator and infrastructure manager. Both sides deny that this could this be the harbinger of things to come and stress that this was only a one off arrangement. Wolsztyn Experience explain that they have enough on their plate running their footplate courses and Smigiel Town Smigiel Town Council do not want to enter into any arrangements of this sort till March. However the thought does come to mind that if Smigiel Town Council – who are the line’s legal owners – were to act as infrastructure manager, and partner with another organisation, with the latter taking the role of operator, there would be no opportunity for the sort of buck passing that took place during SKPL’s tenure of the line. In addition, the Council are hardly likely to charge themselves local taxes, although these could be levied by Wielichowo Council for the rateable railway land and buildings which lie within their parish. There are several heritage railway organisations in Poland who would be delighted – for an appropriate fee – to operate the Smigiel Railway. Wolsztyn Experience has the advantage of being head-quartered less than one hour away and has plenty of experience in promoting and running special trains. It also has access to a large group of people who work as volunteers in various capacities on UK heritage railways. If the Town Council are serious about running their railway as a tourist line, they could do no worse than consider a partnership with Wolsztyn Experience. Watch this space! Last train left in 2005! EU07-134 about to depart from Lodz Kaliska with the last Bohemia express to Prague, 9 December 2005. Photo Tadeusz Nowaczyk. Our ‘By Rail to Rome’ competition is bringing in a number of interesting entries, including a suggestion from David Hughes that our putative pilgrim takes the Minister of Infrastructure along for the trip and that the itinerary includes Lodz. Well David, 10 out of 10 for out-of-the-box thinking, but 0 out of 10 for coming up with a viable route. Lodz (pop. within city boundary 750,00; pop ‘greater Lodz’ 1,500,000) lost its international services in 2005! A great pity, the city once enjoyed direct connections, not only to friendly neighbouring cities such as Moscow, Prague and Dresden, but also such exotic destinations such as Munich, Geneva and Madrid. Destination board on the last Bohemia express to Prague, 9 December 2005. Photo Lodzka Inicjatywa na rzecz przyjazngo transportu. Shortly after we posted our article on the end of international services by Greek railways we came across a post by Paul Tramheer on the drehscheibe-foren.de forum about a tour of Greek railways before they suffered their first round of cuts. The map above shows part of the railway network that existed in 1983 and the lines that were visited. 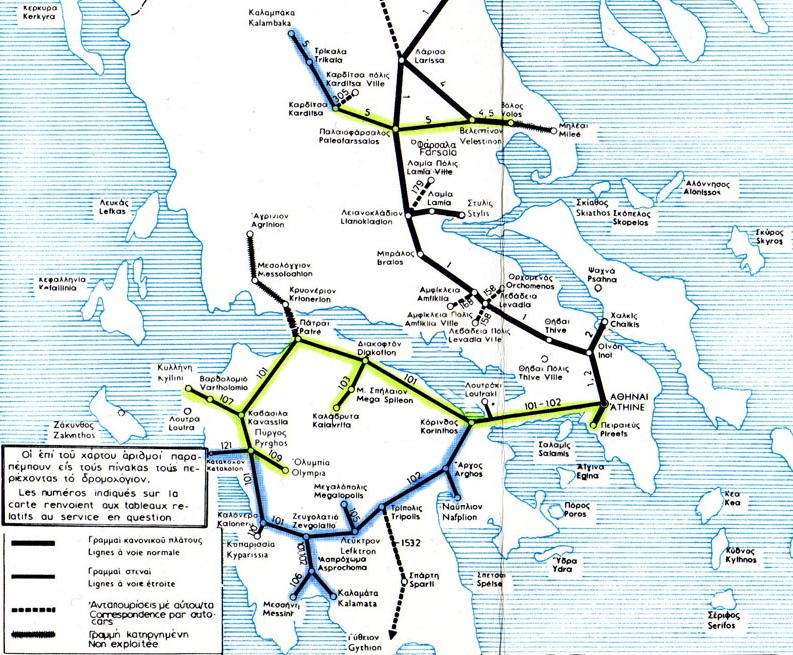 The black line running vertically is the standard gauge line to Thessaloniki with onward connections to Yugoslavia, Bulgaria and Turkey. The yellow lines show the metre gauge lines that were visited. Greek Railways courtesy of All Europe Rail. Under pressure from the IMF, the Greek government is axing some if its railway services. Branch lines will close, including those to Olympia, Argos and Kalamata. All international trains to and from Greece, meaning those linking Greece to Bulgaria, Romania, Turkey, Macedonia and Serbia are being cancelled. Rail passengers will no longer be able to travel from Thessaloniki to Sofia, Belgrade, Bucharest or Istanbul. From 11 February to 17 February, the two trains from Bucharest to Thessaloniki via Sofia will travel only to the Kulata cross-border point between Bulgaria and Greece. After 17 February, these trains will run only between Bucharest and Sofia. The afternoon international train, travelling from Thessaloniki to Sofia, was cancelled from 12 February. The two morning and the two afternoon international trains from and to Sofia to and from Thessaloniki were cancelled, beginning 13 February. 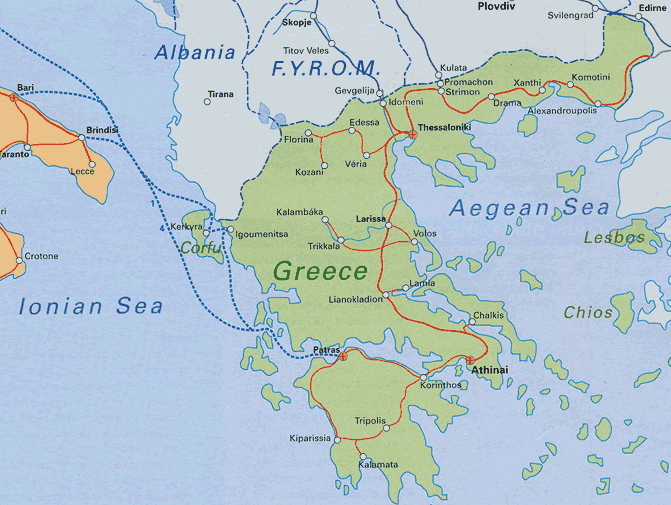 After more than 100 years the overland rail route to Greece has been cut, though international rail travellers will still be able to take a train to Italy and then take a ferry from Venice, Ancona or Bari on to Greece. There are interesting parallels between what is happening in Greece today and the fate of Poland’s railways since the implementation of the so-called Balcerowicz Plan. The governments of both countries have underinvested in their railways with a consequent major decline in passenger and freight revenue. Both governments have preferred to see a gradual decline in railway services rather than to carry out a root and branch pruning of their heavily bloated and inefficient railway administrations. Both governments have focussed their infrastructure investment on improving their road networks and allowed their state railway companies to accumulate debts which were not regarded as part of the government borrowing. Both governments have had to cut their financing of their railways as part of major ad hoc fiscal adjustments being demanded by the IMF. Those BTWT readers who have queried as to why the Polish government seems to be hell bent on following the British blueprint for the reform of its railways may wish to reflect that Britain adopted an IMF ‘rescue package’ in 1976 and Poland an IMF ‘shock therapy’ programme in 1989. Neighbouring former soviet economy countries such as the Czech and Slovak republics, and Hungary have been allowed to implement milder reform programmes without ‘back-seat’ driving by the IMF. Unlike Poland, these countries have met or even exceeded EU guidelines for new investment in railway infrastructure. Below is a reading list which may or may not be relevant. The last three links relate to the IMF’s relations with the UK. International Monetary Fund – Transcript of a Conference Call, 9 November 2010, discussion on likely effects of Britain’s ‘front-loaded’ austerity package. No trains from Poland to Rome? The news that the late John Paul II’s beatification ceremony will be held in Rome on Sunday 1 May has caught PKP InterCity on its back foot. When the Pope’s funeral took place in 2005, InterCity ran 7 special trains to Rome. The company started preparations to do something similar this time – several million Poles are expected to travel to Rome for the event. An immediate press release was issued and picked up by the national press to wet the appetite of would-be travellers. A golden marketing opportunity as airlines have increased fares to and from Rome nearly 8-fold for travel on the days close to the event. There is only one snag – InterCity doesn’t have enough railway carriages to run its normal domestic service, let alone to organise a massive international transportation exercise! A day after it started the marketing push was turned off. A corrective press release was quickly issued with the spin that InterCty is ‘assessing the availability of suitable rolling stock’. One highly placed source informs us – on the condition of strict anonymity – that InterCity may not be running any trains at all! After the various recent debacles on Poland’s railways, IC’s failure to organise special trains to Rome could be the biggest own goal of all. In an effort to do its bit to help those who would like to attend the ceremonies and travel from Poland by rail BTWT is launching a new competition! All you have to do is plan an optimum itinerary for a journey by scheduled rail services from Warsaw to Rome in time for the ceremonies and return. But before you all reach for the PKP on-line timetable, here are a few rules. The obvious route will be sold out, so no prizes for routing passengers that way. In order to fully appreciate the proceedings on the 1 May our pilgrim will need to have slept well – itineraries involving changes of trains at 02:00 hrs. or insufficient sleep in sleeping coaches will have points deducted. A certain degree of out-of-box thinking will be rewarded, but journeys that are potentially very expensive or involve excessive changes will be penalised. It is ages since we had a competition, the last one collapsed because everyone found the questions too hard. We are hoping that this one will attract a record number of entries. Do feel free to post your entry via the BTWT comments facility or via e-mail account: railfan [at] go2 [dot] pl. Zillertalbahn. Video by 1935Gerhard. Hat tip to Railway Misadventures. I sometimes wonder what Poland would have been like if WWII had left Poland on the western side of the Iron Curtain and fifty years under Soviet hegemony had not exhausted its economy. Imagine Poland’s narrow gauge railways continuing to play a role in rural transportation just like the Zillertalbahn. Impossible in contemporary Poland? Well given the we-must-catch-up-with-the-West-at-all-costs mindset quite possibly. But the Smigiel Railway carried up to 90 schoolchildren as recently as five years ago until a council subsidized bus service started running on the same route. 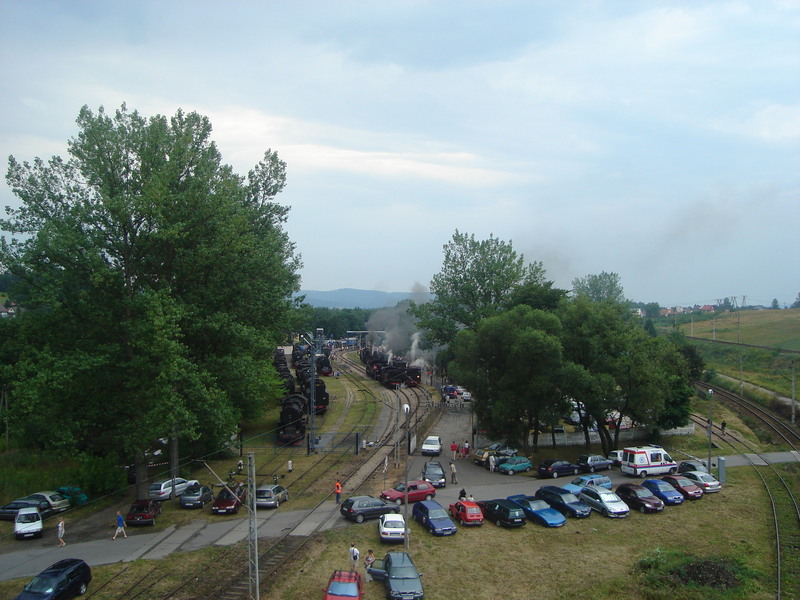 Even the Krosniewice Railway passenger service had its busy peaks on market days and during the All Saints holiday. By the way Gerhard Germann’s video is absolutely suburb. Both the camera work and sound quality are at a level of professionalism rarely found on videos posted on You Tube. 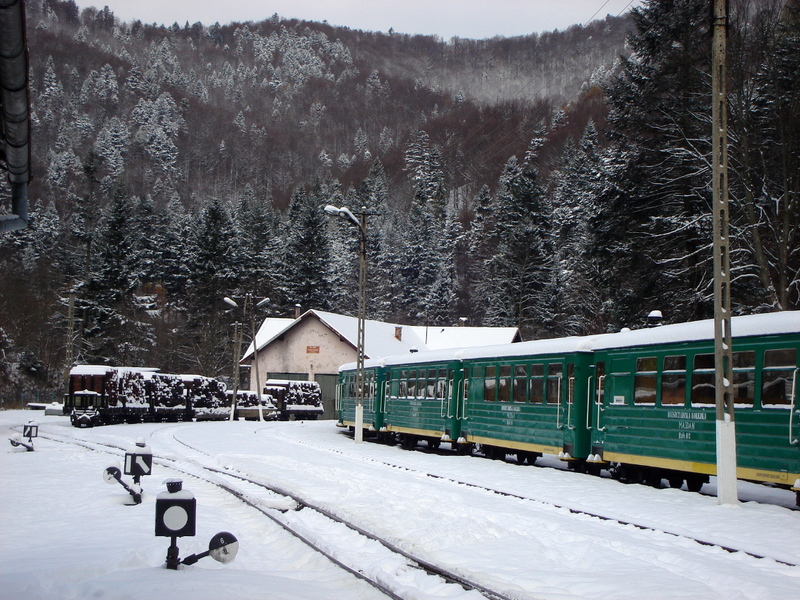 Bieszczady Railway, Majdan yard, November 2006. Photo BTWT. Poland is experiencing a thaw and nearly all the snow has melted. Poland’s two narrow gauge lines in the Carparthian Mountains – the Bieszczady Forest Railway and the Przeworsk Railway are getting ready for the spring. The Bieszczadzy Railway’s EU project has started. Some 1,442,000 PLN (approx £315,000) is being spent on restoring and improving buildings in the Majdan area, essential work on the track and building new passenger carriages. The engine shed and workshops are being insulated, which will enable fitters to work all year round. At the moment such staff are employed on a seasonal basis. This work will also make it possible for the railway to run special trains during the winter season. During the line’s heyday the principal engine shed was at Rzepedz, and the locomotive workshops, located inside the grounds of the timber mill at Nowy Lupkow, were heated by the mill’s district central heating system. Some of the project money is being spent on restoring the historic station building at Majdan. When its outer cladding was stripped away, it became apparent that the main structural timbers were completely decayed. Without the support of the cladding, part of the station building collapsed. Meanwhile work on the Kp4 0-8-0 locomotive which the railway acquired in near ‘Barry Dock’ condition is continuing off-site. If everything turns out as planned, the Kp4 will join the railway in May. Three new steam drivers recently passed out by taking their theory exam at the Railway Museum in Warsaw. [Why on earth is the Railway Museum responsible for passing out heritage railway drivers? D.] The Las locomotive which featured in some of our earlier articles remains in service. So the Bieszczadzy railway will be the only Polish narrow gauge line able to roster two operational steam locomotives. The Bieszczadzy railways EU project is a Polish first – it is the first non-local-authority-owned line to benefit from an EU grant. But it is paying heavily for the privilege. Initially the railway will have to find 1 756 414 PLN (£384,000) being the value of the project plus VAT and, unlike local authority projects where only 25% has to be contributed as ‘own funds’, the railway will responsible for raising some 45% of the project budget itself. Przeworsk Railway, Przeworsk yard, April 2009. Photo BTWT. Meanwhile a meeting took place on 7 Febuary at the offices of the Chief Executive of Przeworsk district Council to discuss the future of the Przeworsk Railway. Among those present were: Mrs Anna Kowalska, the deputy chief executive of the Podkarpackie Provincial Government; Tomasz Strapagiel, the chairman of SKPL; Wladyslaw Zelazny, the general manager of the Przeworsk railway; Zbigniew Kiszka, the chief executives of the Przeworsk district Council; and Grzegorz Krupa of the Przeworsk railway’s supporters association. The principal subjects discussed were the shortfall between income and expenditure on the railway’s operational account as well as the urgent need for substantial funding to carry out essential work on the railway’s infrastructure. While there have been several meetings before to discuss the future of the line, this was the first time that a meeting to discuss the future of the railway was attended by such a senior representative of the provincial government as Mrs Kowalska. No final agreement was reached regarding the resolution of financial challenges that the railway faces. However, it was agreed that a meeting of all the local authorities concerned with the future of the line should take place at the offices of the provincial government in Rzeszow under the chairmanship of Mirosław Karapyta, the new chief executive. All sides felt that significant progress had been made in securing the long-term future of the railway. On 28th of January, Lodz tram train buffs said goodbye to one of their most important landmarks – the tram depot on the corner of ul. Dabrowskiego and ul. Kilinskiego. The depot was constructed in 1928. There is some confusion regarding the actual opening date, some sources give 15 June, others 16th of December. It seems likely that the former date was when the depot, which was still being constructed, first went into operation, and the latter date was when it was officially opened. The depot was designed to accommodate 100 four-wheel tram cars under its roof. In the 1950s, longer twin bogie trams were introduced and the depot and its tracks became seriously congested. In the 1960s, the tram depot was extended and modernised. This capacity was increased to 306 tram cars of which 154 could be kept under cover and 152 on the sidings outside. The tram depot reached the peak of its activity in the 1970s, when 300 drivers were based there supported by 181 technical staff. 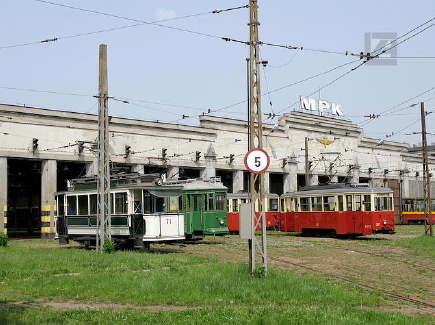 Lodz MPK, the city municipal tram company, constantly hovers on the edge of bankruptcy. Two years ago, the tram depot was sold to a property developer with the stipulation that the tram company vacates the depot by mid-February 2011. There was talk of the tram depot being used to house new light rail rolling stock constructed in Israel, but the latest rumours refer to a new shopping centre. Vintage 4 wheelers at Dabrowskiego depot. Photo ©Wojciech Dembski. The depot’s Art Deco buildings, constructed in a style reminiscent of the station and engine shed at Krosniewice are listed and theoretically protected from demolition. But even if the buildings survive, without their historical technical context of tracks, junctions and machinery they will remain but a pale shadow of their former selves. My thanks to Wojciech Dembski from whose website, Lodzkie tramwaje i autobusy, much of this article has been sourced. Here are some recent stories that have reached the ears of our editorial team. They may have not all been checked for accuracy. If you do find out that the facts are different, please let BTWT and our readers know. Parowozjazda Gala, Chabowka, July 2006. Photo BTWT. The Chabowka Skansen may not have a long-term future. Although the Malopolska Provincial Government had expressed an interest in taking over the skansen from PKP Cargo, the takeover was contingent upon PKP being able to sort out the property titles. It seems that part of the skansen stands on land seized by the Germans from local landowners during WWII, which will make it very difficult for PKP SA to establish its legal title to the land on which the skansen stands. Without title deeds in good order the provisional government is not interested in taking over the skansen. 45 minute run speeded up to 10 minutes. Video horsespoland. This delightful forestry line at Czarna Białostocka has had long-running problems with one of its local authorities. The chairman of the Forest Railway Foundation is privately saying that it matters do not improve the members of the Foundation will seriously consider relocating their collection of 600 mm rolling stock to another site. Krosniewice coal yard, December 2006. Photo BTWT. The Krosniewice Railway continues to deteriorate in the not-so-safe hands of Barbara Herman, the Mayor of Krosniewice. Machine tools have been stripped from the workshops and the lifting barriers, which in PKP days guarded the level crossings in Krosniewice, had been cut up for scrap. It seems that there may be more to the skansen at Milicz than we reported in our recent article. Apparently the collection of suitable rolling stock is only a first stage. The local council is intending to restore its section of the Wroclaw narrow gauge railway and operate it as a tourist attraction. Px48 dumped at Mlawa. Photo U.M. Mlawa. The future of the Mlawa Railway is in doubt following the collapse of a 26 million EU-assisted restoration programme. The money had been reserved by the Mazowieckie Provincial Government as part of its tourism development programme. The funding was dependent upon the local authorities, through whose territories the line runs, coming up with 3 million zloty funding. Sadly though the local authorities had signed up to the plan in principle, none were prepared to back up their declaration with cash. Jerzy Chmielewski’s obituary notice on Piaseczno Railway website. Jerzy Chiemielewski, the chairman of the Piaseczno Railway’s supporters’ association died on February 2. Jerzy had little time for democracy or consultation and there were frequent arguments with supporters in the line’s early days. Yet Jerzy had powerful political connections dating back to the communist era and he used these to good effect to advance the cause of the railway. He will be best remembered for bringing Px48-3917 to Piaseczno. The locomotive was constructed by Interlock from three other locomotives and rebuilt in the railway’s workshops at Piaseczno. Dark days ahead for the Smigiel Railway, May 2009. Photo BTWT. There has been no sign as yet of the local authority taking any steps to open the railway for the 2011 season. Lapy is a sad town. Over 2,000 adults are unemployed in a town with a population of approximately 17,000 – some 5,000 families. The principal employers were the sugar refinery and the carriage and wagon works. The sugar refinery closed as a consequence of the Polish government agreeing to limit Polish sugar production – part of the deal under which Poland entered the EU. The carriage and wagon works went bankrupt as a consequence of the government’s pro-road transport policies – part of the deal under which Poland was allowed to join the West. Warsaw has given up on Lapy and many other similar towns, which is why even the remotest British villages now have Polish graduates working in pubs and restaurants. As if to rub the message in, PKP has closed down all the facilities inside the grubby 1970s station building. Tickets now have to be bought from one of the shops in the centre of town. We bought first-class tickets and waited for our train at the head of the platform. The first-class carriage was down at the other end of the train. Trains do not hang around in places like Lapy so we jumped on board and made our way down the train. A few carriages further on we made a pleasant discovery – there was a restaurant car and it was open! We dumped our bags in a compartment – the first-class carriage was next to the restaurant car – and asked the attendant what he might recommend. The choice narrowed down to either kotlet schabowy or pierogi. We chose kotlet schabowy and we were not disappointed. Now at this point I will confess that I was tired after our meeting and was not thinking as analytically as I should have been. In hindsight I should have been asking, what is a restaurant car doing on a train between Bialystok and Warsaw? Or even, what is a restaurant car doing on a TLK train at all? My lack of curiosity was to lead to more adventures later on. We arrived at Centralna 5 minutes early at 18:05 and both got off the train. My companion had to change to a train heading down the line to Poznan while I needed a train going to Lodz. The train that we had been on was heading to Katowice, presumably via the CMK. As we got off the train I noticed that the destination indicator on the platform advertised a stop at Koluszki, so the train would not be taking the CMK after all, but the older route via Piotrkow Trybunalski and Radomsko. Koluszki I noted was also on my route to Lodz. We took the escalator up to the bridge deck that spans the tracks to check the departure indicators. The train that we had been on was due to depart at 18:15. The Lodz train was due to depart at 18:25. I made a snap decision, rather than risk travelling in one of the dreaded E74 sets, I would return to the train that we had been on and the comfort of the first-class compartment. I would leave the Katowice train at Koluszki and wait for the Lodz train there. It seemed a no-brainer that I would arrive at Koluszki ahead of the Lodz train. So I dashed back to the Katowice train, settled myself comfortably in our old compartment and relaxed. We rattled along the tracks as far as our final Warsaw stop at Zachodnia and then began to build up speed. The train ran faster and faster. I estimated that we were doing about 90 miles an hour and the thought did cross my mind that the Lodz trains, whether locomotive hauled or EMU, never seem to reach more than 80 mph and only run at that speed for a brief period of time. I dimmed the lights so as to be able to follow the night view better and spied a huge rail connected Tesco warehouse to the north of the tracks. Surely this is not one of the landmarks on the route to Koluszki? We flashed under a modern road bridge and passed through a station which should have been Skierniewice yet was not. Finally we passed through another station which I recognised as Sochaczew. 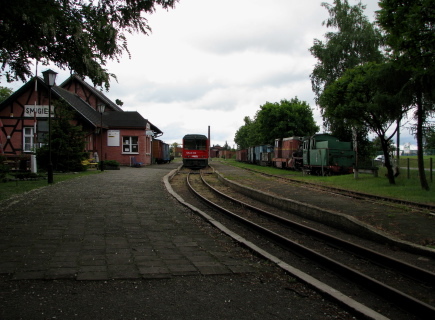 (It is after all the terminus of the Sochaczew narrow gauge railway!) Suddenly I realised what had happened – the train had taken the ‘mainline’ to Poznan instead of ‘turning left’ just after Warsaw and taking the Skierniewice route. After what seemed a very long time, train slowed and branched off to the left. We ran – more slowly than on the main line – through wooded countryside past abandoned stations where the snow had piled itself high on old platforms. If we were about to rejoin the usual Warsaw – Koluszki route there would be ‘action’ on the left-hand side of the train so I moved across to the window on that side. Eventually a large town came into view. Could it be Koluszki? We passed a signal cabin, but it was too close to the train to read its location code. We reached a triangle, one pair of tracks turned sharply to the left, we took one of the tracks forking sharply to the right. I was puzzled until I saw the mainline to the left. Could it be? Yes it was. The train had reached the triangular junction just to the South West of Skierniewice station. What a curious route for the the train to take? Now it began to dawn on me that though my train that had departed Centralna 1o minutes before the Lodz train,the latter would probably reach Koluszki ahead of us. Lowicz – Skierniewice newly griced route. Google Maps. We reached Koluszki at 19:39 and I hopped off smartly. A quick check of the printed timetable said it all. The Lodz train had departed 9 minutes earlier. What was the reason for routing my Katowice train via the mainline through Sochaczew via a diversion that added exactly 20 minutes to our journey time? Amazingly the Koluszki ticket office was still open. I ascertained that the next Lodz train would leave at 20:40. It would get me to Lodz an hour later than if I had swapped trains at Centralna in the first place. Now, with the best part of an hour to spend Koluszki I began to study the timetables. Where had my extraordinary train come from? Gdynia? No surely there was a mistake? Via Bialystok? Yet the arrival and departure timetables tallied, that indeed was the route of, my train. The tour de Pologne. Timetable by TK Telekom. On my return home I used the PKP Internet timetable to find my mystery train. You will hunt in vain if you enter ‘Gdynia’ as departure station and ‘Katowice’ as your destination. But enter ‘Bialystok’ in the ‘via’ field and out it magically pops – TLK54108 – one of the most extraordinary workings over the Polish railway network which PKP InterCity in a flash of inspiration have named the Tour de Pologne. There are still plenty of trains in Poland with ‘proper’ compartment carriages. Lodz-based EU07-457, on an empty stock working to Warszawa Wschodnia from Warszawa Odolany carriage sidings near Warszawa Zachodnia. From Wschodnia the locomotive and carriages will become a fast train to Lodz Fabryczna. August 2006. Photo ©Marcin Zaton. The last post, Short change for Poland’s railways, provoked a flurry of comments. A number of correspondents drew parallels between what is currently happening in Poland and the decline of the railway network in the 1960s and 70s in Great Britain. There are many parallels, both in terms of what is happening on the ground, and also with regard to some of the external factors and constraints which helped to shape national transport policy in both countries. We will be examining some of these in later posts. Today, I would like to address the comments of two correspondents who suggested that things have become so dire on Poland railways that it is no longer worth visiting the country and attempting to travel on its rail network. As a riposte consider the log of my outward journey on Monday. My ‘customer experience’ started at 08:15 when I arrived at the ticket office at Lodz station. The undignified scramble which awaits early morning passengers trying to purchase tickets for trains arriving in Warsaw before 09:00 was already long over. There was just one passenger ahead of me when I joined the queue to buy my ticket. The price, 52 zloty (approximately £11) for a journey 292 km (181 miles) was a pleasant surprise. Another pleasant surprise greeted me on the platform. My train wasn’t the hated ED74 PESA EMU waiting on another track but a decent locomotive hauled train composed of compartment stock. Trains between Lodz and Warsaw are regularly used by Minister of infrastructure, Cezary Grabarczyk, and I have a suspicion that in spite of the fact that there are sufficient ED74s to cover all the roster, the locomotive hauled trains have been retained for workings which the Minister might be using himself. Once on the train, I found a compartment which was occupied by only one other person. Three ladies got on at Lodz Widzew and by Koluszki had become bored with their own company and had used their mobile phones to track down another of their friends on board the same train. Even when she joined them, and there were six of us in the compartment, there was plenty of room to stretch and I could use my laptop in comfort. It was only at Zyrardow,where a rather portly couple joined us, that the seating became rather tight and I was forced to put away my laptop. Thirty minutes later the portly couple decanted themselves at Warszawa Zachodnia and we could breathe again. I had decided to change trains at Centralna rather than at Zachodnia as prompted by PKP’s electronic timetable. At Centralna, the PA announcements are fairly clear, and the platforms are close together should there be a last-minute alteration. Soon my friend arrived on the Poznan train and we hurried off for a quick cup of coffee while awaiting the 11:05 to Bialystok. Centralna is being given a facelift and builders and painters seem to be everywhere. Nevertheless, trains are running, train indicators are working and train announcements are clear and comprehensible. We were on the platform a good 10 minutes before our trains was due. The train had started at Bydgoszcz and not all the passengers had got off at Centralna. We had serious things to discuss and a PowerPoint presentation to review, so my friend suggested that we grab a first-class compartment and pay a supplement when the ticket inspector came to check our tickets. The inspector duly came and we launched into our prepared speech. The inspector gave us a broad smile, There will be no need to pay a supplement, gentlemen. I have a whole carriage reserved the Ministry of the Interior. I’ll unlock the compartment just for you. Quality customer service experiences like these are caught occur more often than you might think Polish trains, particularly if you approach the staff politely. It’s just a pity that they not give more support by the men in suits who preside over them.